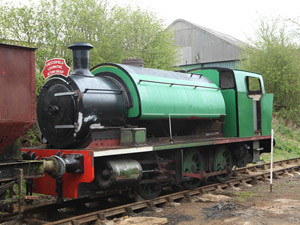 This loco represents one of the last two examples of the robust modern six-wheel steam locomotives used extensively by the United Steel Companies – Ore Mining Branch, notably when the Exton Park system was developed in the early 1950’s and connecting to the British Railways Cottesmore Branch at our Museum site. It was logical that the United Steel Companies would source their locomotives from the subsidiary Yorkshire Engine Company based in Sheffield, both for the initial fleet of steam locomotives and later the replacement diesel locomotives of which our own DE5 is a prime example. This locomotive, which came from the same batch of locomotives as those delivered new to Exton Park, was instead delivered to the Appleby-Froddingham Steel Company in Scunthorpe and ran as their number 9 until displaced by diesels and sold off to the National Coal Board North Nottinghamshire Area in the late 1960’s. The locomotive is now on loan from the National Coal Mining Museum and is being presented in the form in which the Exton Park locomotives ran at our site as a rare representative of the striking and distinctive class of locomotives to have worked here. The locomotive will retain its lifelong running number; No. 9.